Windows Phone Apps: When Will I Get Paid? For a large portion of 2014, I have been dabbling with Windows Phone and Windows Store apps. A common question that I have seen asked by app developers is when will I get paid. If you have a paid app (not free) in one of the Windows stores, you have to meet a minimum revenue of $200 before Microsoft will pay you. 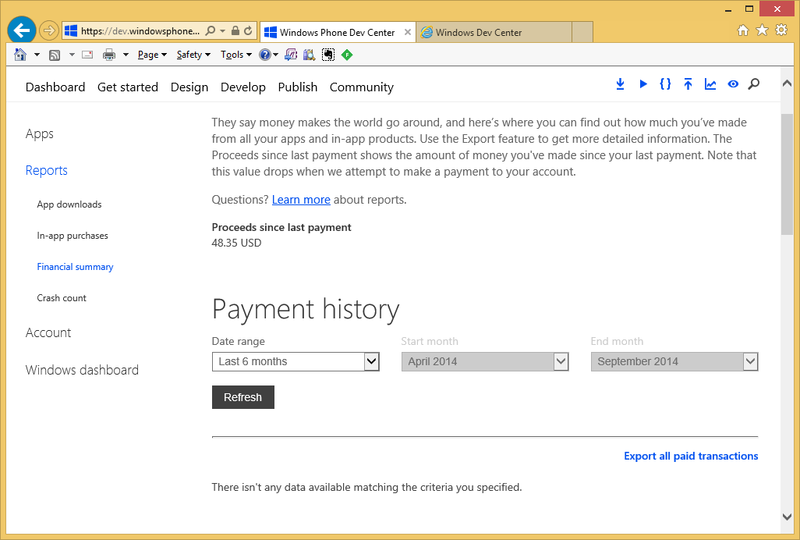 For Windows Phone, you can find out how much is currently owed to you by going to to the Dashboard in Windows Phone Dev Center, click on Reports, and click on Financial summary. There you will see the amount you are owed under the "Proceeds since last payment" label. I noted that I was owed more than $200 at the beginning of August. I assumed that I would get paid right away. However, I couldn't find anything stating that they did actually issue payments right at the beginning of the month. I finally received my initial payment on September 11th. Based on my experience, I'm guessing that it takes roughly a month and a half from the time that you end a month with more than $200 before you get paid. Additionally, it seems that the amount of your payment will be based upon the amount that you were owed at that time instead of the amount that you were owed when payments were actually distributed. Of course, this is just speculation on my part. I noticed that a lot of people were asking about this, but did not offer up definitive answers. I'd be interested to hear what the experiences of others are in this arena. Did you get paid in about the same amount of time, or did it seem to work differently for you?